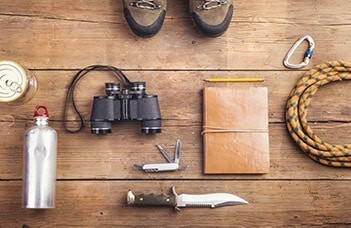 Everyone has their own list of items for a bug out bag, but few have a special bug out bag for the collapse of a civilization. So when Russia and China combine forces and nuclear war destroys everyone except you… it’s time for the collapse of civilization bag. I would certainly change the contents of my packing list if you plan for civilization’s permanent collapse, but assuming that you only have to Rambo around for a few months while the White House is rebuilt, this is exactly what I’d bring. 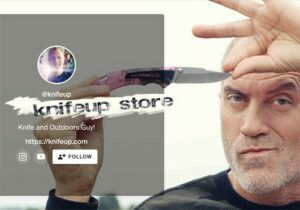 We are knife fanatics here at KnifeUp. So obviously, the first thing on our list is the Ka-Bar BK3. In our review of the best survival knives, we gave it our top rating. Why the BK3? Because it’s 12 inches of pure testosterone. It’s sturdy enough for wood batoning, which would be essential for building a shelter, and at the same time lightweight and portable enough to keep on your hip. Surviving the end of modern government is bound to make a man thirsty, for that, I’d bring the LifeStraw personal water purifying straw. The LifeStraw can purify up to 1,000 liters of water per filter and uses no chemicals which would leave an undesirable taste. 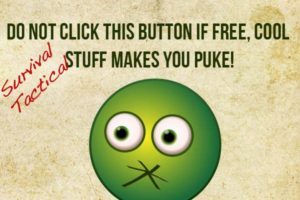 If you packed iodine tablets, you should know that an average 50 caplet bottle will only purify 20 quarts of water, and you have to wait 35 minutes for each drink–which tastes terrible. If you have ever tried to start a fire in an intense wind or unfavorable conditions, you know how difficult it could be. What’s the anarchists’ lighter? The Windmill Delta Stormproof Lighter. 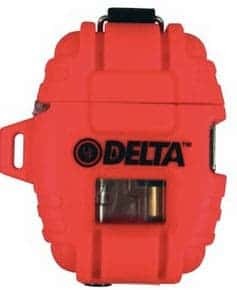 Unlike most lighters which fizzle out at about 100 ignitions, the little puppy is valid for 30,000 ignitions and can do so in winds up to 80 miles per hour. 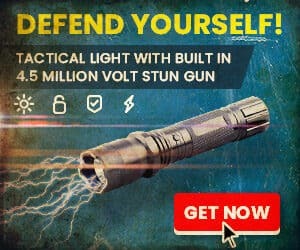 It’s waterproof, impact resistant, and is a proven zombie slayer–just add a torch. This is one area where I would not compromise. I’ve tried just about every jacket out there. Some work well in snow, others in rain, but I have never found the perfect coat for survivalists. However, THIS one comes pretty close. There are cheaper ones on Amazon and elsewhere, but they have very little insulation, or they are bulky, winter coats, or they are constructed poorly, etc. The best combination I’ve found is a waterproof and tear-proof outer layer, with a thin, light, polyfill inner coat for warmth. It’s the perfect combination for facing any harsh condition. If you’ve ever watched Survivor, you know that the one item the players fight over is the tarp. There is always food to be found and water to be collected, but nothing destroys the survivalist’s spirit more than exposure to the elements. Shelters can always be built to help, but nothing beats a tarp. Getting wet in cold conditions can be the kiss of death, so it just isn’t worth the compromise, especially when we have 10 items to bring. If you are going to die in the cold, it is going to be during the night. Conditions are colder at night, and the lack of movement can exacerbate the issue. Like several of the items on this list, paracord could easily be skipped because rope can always be fashioned out of vegetation. However, having tried a number of times to make strong rope from vegetation, useable results are often quite difficult to achieve. Since we only have to survive for a few months, paracord is a no-brainer. Yes, people. Swedish fish. How am I supposed to live through the collapse of civilization without the bare minimum in nutrition? And if we’re going to have Swedish Fish, we might as well have the good kind. This year I ate Swedish fish FROM Sweden and they were delicious, multi-colored, and much larger than the kind that Crap-Mart gives us. As soon as civilization collapses, I’m headed to Sweden and I will be looting Swedish fish from every grocery store in the country. 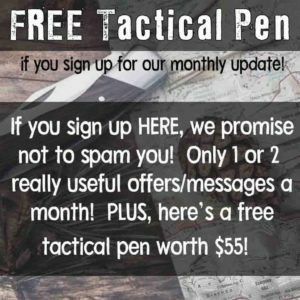 Try and stop me–I have a Ka-bar Survival Knife. MREs are a blight on society–but when society no longer exists, it’s chow time. Being a military kid, I grew up eating MREs when we went camping. The crackers and jelly taste like horse fat, and the chocolate candy tastes like rancid chalk. It isn’t a glamorous meal, but the military has spent millions of dollars developing them for a reason. 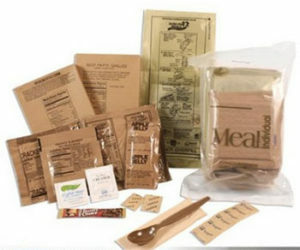 MREs are easily stored and carried, are loaded with calories, and provide passable food for those without taste buds. You are sure to run out of food before the Pentagon looks like a pentagon again, but having a stockpile of food will get you through the first few days and any trouble spots. What did I miss? Is the list completely wrong? Let me know in a comment, and I’ll see you at Armageddon. Where’s your first aid kit? You don’t even have Band Aids! Yes, when a zombie rips my limb off I’ll put a band-aid on it. That’ll make me feel much better. I would certainly add a Light My Fire firesteel set. I have been using the Scout model and love it! I’ll take a couple of disposable Bic lighters over Zippo or any of the butane models. Fuel & flints are going to be the problem, though the Zippo will work on gasoline if you’re careful — and clean the thing daily. But a standard Bic lighter will light 2 packs of cigs a day for about three months — or a couple of thousand short lights. Bics have a LONG shelf life. I’ve had them sitting around for two or three yrs in an unused jacket pocket & they work fine And if it gets completely soaked, just let it dry a bit & it’s as good as new; not so for a submerged Zippo. All this for slightly more than a buck … can’t go wrong. And they’re damned fine trade goods for those who didn’t plan ahead. Once they’ve tried rubbing sticks together a few times, they’ll trade anything, including their virgin daughters, for something that will light 1000 campfires or more. Secondarily — Bics have a lot more flint than they need, so they can strike lots of sparks even when they run out of fuel. With some needlenose pliers & some practice, you can extract over a quarter inch of good flint from a “dead” Bic — and then trade it to the Zippo owners when they run out. Only get Bic. The Asian clones are absolutely undependable junk. I plan on having several other long-term means of making fire, but those 40 or so Bics I’ve got stashed give me a warm fuzzy feeling. Like all those P-38 and P-51 can openers stashed in a drawer. Excellent! Hardly anyone mentions this for prepping, but a stash of good books can keep you from going nuts. Don’t forget to include some on first aid, gardening, dressing game, trapping and other useful stuff.